This fun and challenging workout was designed by qualified professionals (both dog and fitness – trainers) to stimulate the mind, focus on the body, and create a soulful connection that will bond you and your dog forever! We’re the one-stop fitness program where everything gets done in an hour ( saving time and money) and nobody is left behind (or at home in this case)! By enlisting in our bootcamp, you’ll not only get the body you’ve always wanted, you’ll have a well trained, happy dog too! Let’s face it…you need exercise everyday, your dog needs exercised everyday and you both need obedience training to have a long, happy, stress free life together. At Thank Dog! 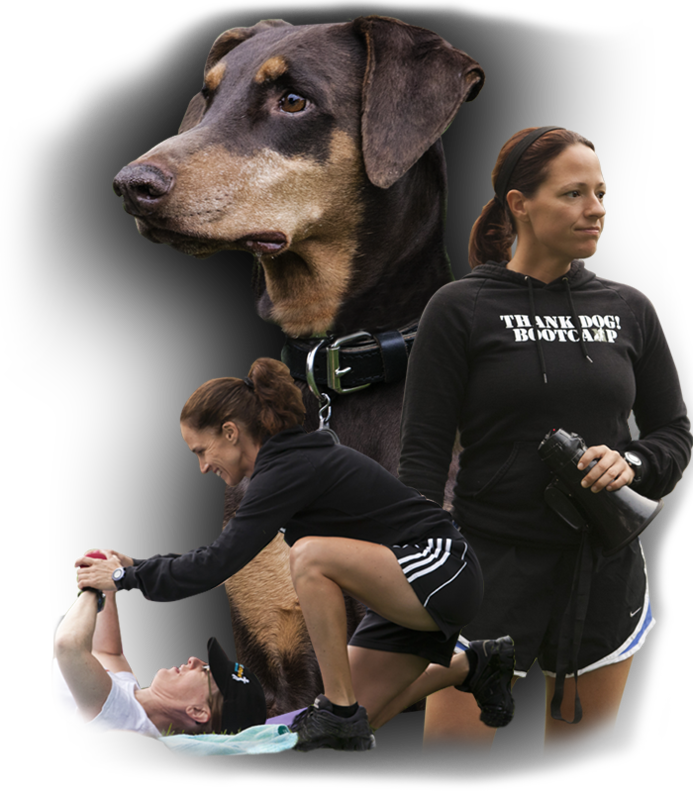 Bootcamp…Your DOG is your workout partner! GET IN TOUCH: email: Nashville, TN or Cortland, OH. GET ON THE THANK DOG! LIFESTYLE CHANGE! GUARANTEED – Our bootcamp- style workouts average 600+ calories burned! OUR APP IS FOR SALE!! Thank Dog! 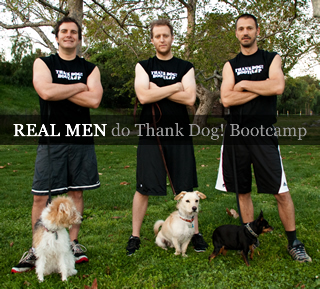 Bootcamp has released a mobile app for the iPhone that allows dogs and owners to train and work out together! “We get so many people that want to do our program, however, they don’t live near one of our locations. So, we decided to do something about that,” says Jill. Although we would never give our entire program away, this app will give you 20 – challenging, yet fun – 1-hour workouts using a resistance band and your dog. All routines are voice instructed while you listen to your favorite music! It also includes GPS, Facebook/Twitter share and finally images and videos for guidance. Download it here! or view the website! This is not a cutesy workout. We don’t just add your dog to run around with, nor do we do agility. We’re the most organized, SAFE yet challenging dog/owner program out there today. This is a bootcamp! Dogs are always in a command (even when running – we call that “HEEL!”) and the owner is ALWAYS moving. If you want to lose weight and/or tone up and have a dog (trained or untrained, fat or skinny) or want to borrow one– join us! We have ALL fitness levels and body sizes. EVERYONE FITS IN! These are some of the media pieces we appeared in. The first one is The Dog Whisperer! Super fun and Cesar is such a nice guy. The 2nd one is of Animal Planet’s, DOGS 101, starring our boot camper, Lorena and her pup, Diego. The 3rd one is MSN Wellness. The 4th one is the Today Show. We appeared in a lot more, but these are longer so you can get a feel for what we do.